Captain Lisa Irwin is a REME Reserve Officer currently on a three-year Full Time Reserve Service commitment with the Defence Cultural Specialist Unit. 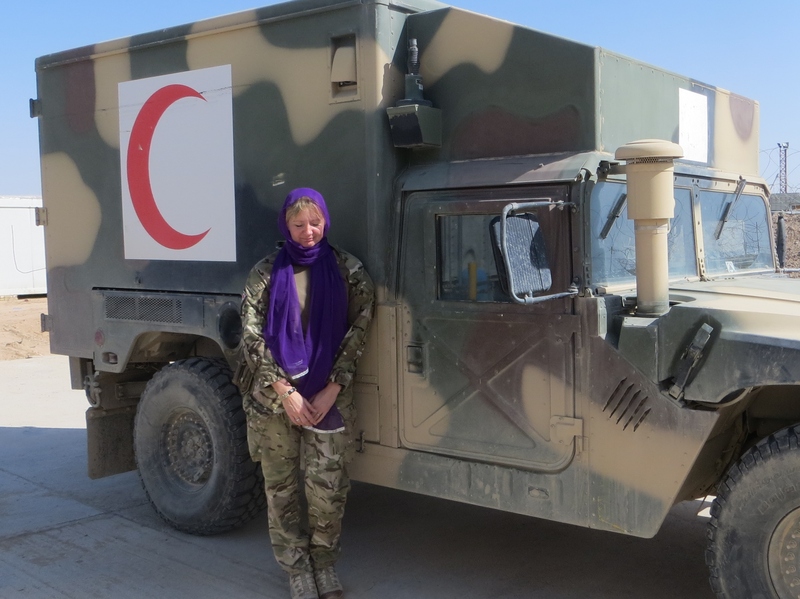 She has spent 15 months learning Pashto and Dari before deploying to Camp Bastion to be the 2 IC of a team of medical personnel set up to mentor Afghan medical personnel. 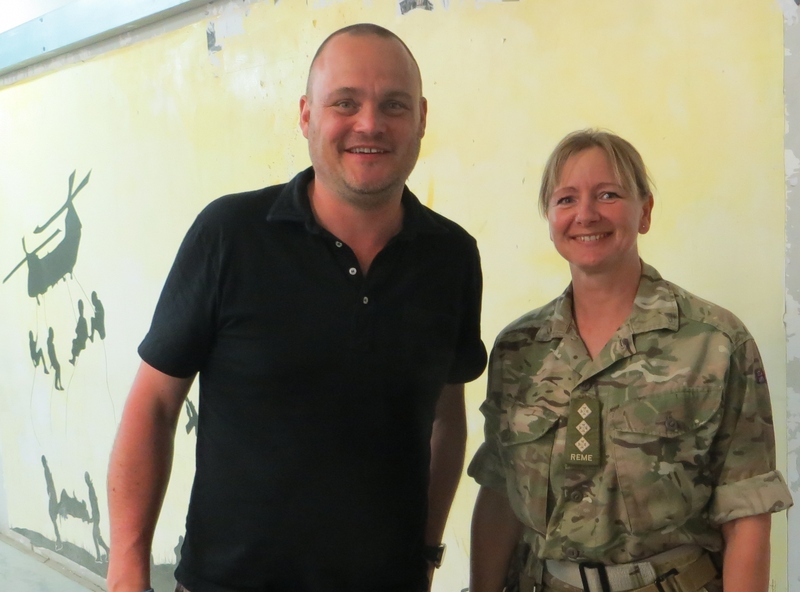 This is her third tour of Afghanistan and her second blog, as she blogged during her last tour in 2010/2011, when she was deployed as a Female Engagement Team Commander. As I sit in my tent typing this it feels very odd as everyone else in the tent is packed up and ready to go back home. The Med Group personnel are changing over so it is out with the old and in with the new, apart from a small number of people that will endure like me. Many of the people going have become my friends and I shall miss them, and most of the Med Dev team have changed over so there will be a period of adjustment for all of us. My new OC (Officer Commanding) is a good bloke so I think we will work together well and the new CO (Commanding Officer) of the hospital seems to be good too, and he understands the importance of what the ANSF Med Dev Team does and will support us in our endeavours. The new team are bedding in to their roles at the moment so the atmosphere at Shorabak is very different when we go over; the guys are finding their feet and our Afghan colleagues are assessing them and seeing how they work. It takes a bit of time to develop a good relationship- and the previous team had an excellent relationship with the Afghan medics and doctors- so I am sure in time the atmosphere will be as it used to be. There is some continuity with me still being here as 2 IC (Second-in-command) and our 3 British clinicians will not change over for a few more weeks. It does feel as though I am being ‘left behind’! I will go through this again in July too as most medical personnel only do 3 months at a time out here so later in the year I shall witness another changeover. I got to meet Al Murray, who was performing a show. I was lucky enough to see Al Murray perform when he came out here recently. More than that I also got to meet him in his dressing room before the show. I stumbled somewhat over introducing myself as I thought ‘Hi I’m Lisa’ was perhaps a little too informal, but ‘Hi I’m Captain Irwin’ was too formal. So, instead I looked a bit of an idiot when shaking his hand as I said ‘Hi, …….I’m………Lisa’! The show was excellent though, including the 2 support acts. I haven’t seen many shows whilst deployed, as I haven’t been in the right place at the right time, but they are always excellent for morale so well done to the artists that volunteer to come out. There has still been little kinetic activity (fighting) out here, as the Afghans and insurgents have been focussed on harvesting the poppy, so that has meant few casualties. The harvest finished recently and there still hasn’t been much of an increase. It is a difficult one as we are glad that less people are being hurt but it also means less opportunity for the team to mentor the Afghans in difficult medical situations. There have been instances of casualties arriving at Shorabak whilst we are there and that happened again recently with one of the medics telling me ‘casualties are coming’ as the ambulance pulled up at the Emergency Department door. The casualties were 2 ANA that had been burned when a cooking pot exploded. We watched how they dealt with the casualties, who mainly had burns to the arms and face, and interjected with advice on occasion, and the casualties were dealt with promptly and efficiently. It perhaps was not how we would do things but their way worked for them and the casualties received appropriate treatment and are now recovering well. With our time left out here rapidly reducing we need to make the most of every opportunity that we have to mentor so that we can leave the ANSF trauma care in as good a state as possible. To enable that we sought permission to mentor at night too and that permission was recently granted and was enacted tonight. An ANSF casualty came in to Bastion via helicopter and his injuries were such that the ANA doctors in Shorabak would not quite be able to manage him on their own but would be able to with some of our team mentoring them. After several phone calls made by my OC and I the casualty was transferred over to Shorabak, a small team of mentors was sent over ( with Force Protection) and I am happy to say that the case went well and the casualty is now recovering. It was the first reactive mentoring case carried out at night and the team, plus everyone else involved with ANSF Med Dev, felt it was a step forward in the mentoring process. The past week has been a bit of a blur as I have been very busy. Not only have I been busy with the usual tasks of my job but I also volunteered to teach basic Dari to anyone interested in the Medical Group (though primarily the ANSF Med Dev team). Dari is not my best language (Pashto is much easier for me) and I am not a qualified language teacher, but the classes seem to be well received and the small things that I teach enable the team members to communicate better with their Afghan colleagues and thus help to develop their relationship. An Afghan Warrior is treated by Afghan medics. We had a day last week when there was an influx of ANSF casualties presenting both to Bastion Hospital (having been evacuated by ISAF helicopter) and to Shorabak Hospital. The first I was aware of the casualties coming in was via a phone call at approximately one in the morning which necessitated me dressing quickly and heading in to work. There I met the OC and our clinicians waiting for the casualties to arrive. The next few hours passed in a blur of phone calls, discussions about treatment and where the casualties needed to be treated (ie did they need to stay in Bastion or did Shorabak have the capability to manage them) and a host of other things. Suffice to say I had 2 hours sleep that night (my OC had less!) and still worked a full day the next day. I think I was running on adrenaline! This week my OC and I were introduced to an Afghan Major General who commands the ANA 215 Corps (the ANA we work with belong to his Corps). As usual I was wearing my headscarf, which he commented on as good because it showed my respect for their culture, and I had a conversation with him and then gave him a brief on the Shorabak hospital and its capabilities- all in Pashto. At times I was uncertain if I had the correct word but I looked to the interpreter who nodded at me to carry on and the General listened intently and thanked me for my brief. The interpreter reassured me it was good Pashto and I felt really pleased. My language ability has definitely improved during my tour- although I am far from fluent I can definitely get by. I shall be moving to a new job next week to cover someone’s R&R and I think it will be another varied and interesting job- even if I am only doing it for 2 weeks. 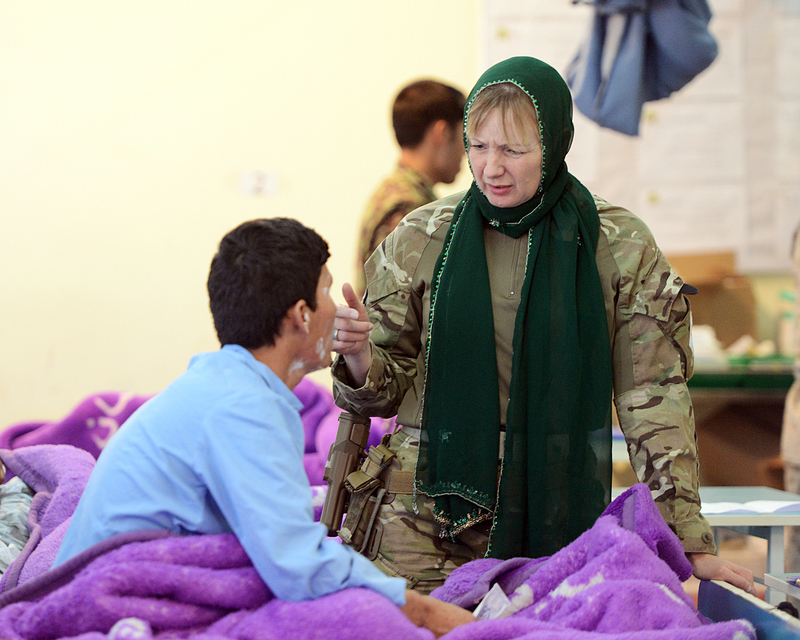 It involves working as an advisor with some of the Afghan Doctors who are responsible for training frontline medics, to ensure ANA casualties receive the correct care when they are first injured. It will enable me to develop a deeper understanding of the whole casualty care piece, from point of wounding to receiving treatment at Shorabak (or in some cases at the moment in Bastion) and so I am looking forward to it very much. Particularly as the doctors appear to know of me and are looking forward to working with ‘Touran Leila’, as I am known in Shorabak (Touran is Dari for Captain, Leila is my ‘Afghan’ name). Today was a momentous day for me, my eldest son turned 21! Being in the military can be really hard at times as you want to be able to share special occasions with family and friends and the separation can be tough. However, the wider military family are very supportive of each other and we all know how difficult it can be so there is a lot of understanding and support. We are actually quite lucky now as the military has become pretty good at welfare provision. We have internet and telephone access, and even when I was working at small remote check points on my last tour I was able to make calls via a satellite phone and not feel completely cut off from home. There has been a definite reduction in insurgent activity over the last few weeks, despite the Afghans holding their elections. The Afghan Government increased operations conducted by their security forces and it seemed to work, with relatively few casualties coming in. However a few days ago one of our interpreters phoned to say they were expecting a number of casualties injured by an IED. Initially it was difficult to get a clear picture of what had happened and when the casualties were expected but after a couple of minutes of speaking to my interpreter he handed the phone over so I could speak to the ANA Colonel in charge of the incident myself. Well, my Pashto isn’t bad but trying to conduct a conversation over the phone, without the cues of body language and gestures, is quite difficult! However, to my relief (and, I think, the Colonel’s) I understood what he was telling me and realised that the casualties were several miles away, coming by road. I relayed the message to the Bastion hospital command team and asked the interpreter to call me when the casualties arrived. Several hours later in the early hours of the morning, he rang back to tell me the casualties had made it to Shorabak and there were two that the ANA doctors were concerned about. I quickly got dressed and hot-footed it to the hospital (thankfully only a few minutes from my accommodation) and informed the night staff that the ANA were requesting to transfer two casualties to us for examination. A couple of phone calls later we had the go-ahead to receive them. One was not too sick and was returned to Shorabak after being examined but the other had multiple injuries and needed an urgent operation. Thanks to the expertise of our medical staff, and to all those involved in moving the casualty to Bastion, he is now recovering. The lull in kinetic activity has continued so we have seen few casualties either at Bastion hospital or at Shorabak. Those that have presented to Shorabak have been managed competently by the Afghan clinicians and medics and moved as soon as possible to Kabul to receive further treatment if required, or to recuperate. In terms of mentoring, the best teaching opportunity is when a case comes in that is suitable for reactive mentoring but that also enables us to conduct other teaching sessions with the clinicians and medics simultaneously, though it can sometimes be difficult to hold their interest! We are now coming up to the handover/changeover of the Bastion hospital personnel, which also means most of the personnel in the mentoring team. It will be hard to say goodbye to people that have become my friends but I know they are all hugely looking forward to going home. I shall be the continuity (although the new doctors have been here for almost a month already) so it will be very important for me to keep communication flowing in the team and for me to look out for them. They will be working in a strange environment and most of them will never have worked with ANA before, so they are facing quite a challenge. However, I am sure that they are looking forward to it as much as I was, and I will be able to reassure them that it is an interesting and challenging, if at times a little frustrating, role. I have been lucky enough to have been able to go home for almost two weeks’ rest and recuperation this month so I haven’t been over to Shorabak as much as usual over the last few weeks. It was lovely to go home though and see my fiancé and children. I also managed to go up to Scotland to see my parents and siblings, but driving to visit everyone did mean that I was almost glad to come back to Afghanistan for a rest! My fiancé and I managed to go and see our wedding venue in Scotland and it is lovely so we are both really happy and looking forward to the big day. I also managed to fit in a shopping day with my daughter and bought her bridesmaid’s dress. She looks absolutely beautiful in it and without doubt will overshadow the bride, but as the bride is me, and I am a very proud mum, I do not mind at all! Whilst I was away there weren’t many casualties so things quietened down a lot for the team, and in particular for my Commanding Officer and the Sergeant Major who was covering for me. The team continued to go over to Shorabak on routine visits to carry on with mentoring tasks but there were fewer reactive mentoring cases. My R&R also coincided with a few changes on the team and we now have a completely different set of clinicians. The General Surgeon, Orthopaedic Surgeon and Anaesthetist changed over as doctors do shorter deployments than the other team members, so there were some new faces when I returned. They weren’t completely new to me though as I had met them when training prior to coming on tour. Customary Afghan food to celebrate the New Year. When I was on R&R Afghanistan celebrated its New Year (their New Year is usually around 21 March) so before I went on leave I made sure that the team were aware of the relevant cultural practices and had plans to take some food to Shorabak to share the New Year celebrations with our Afghan colleagues – and importantly that they also knew how to say ‘Happy New Year!’ in Pashto. The Afghans had a two-day holiday to celebrate the occasion so the team didn’t go over on the actual day but celebrated with them when they returned to work afterwards. 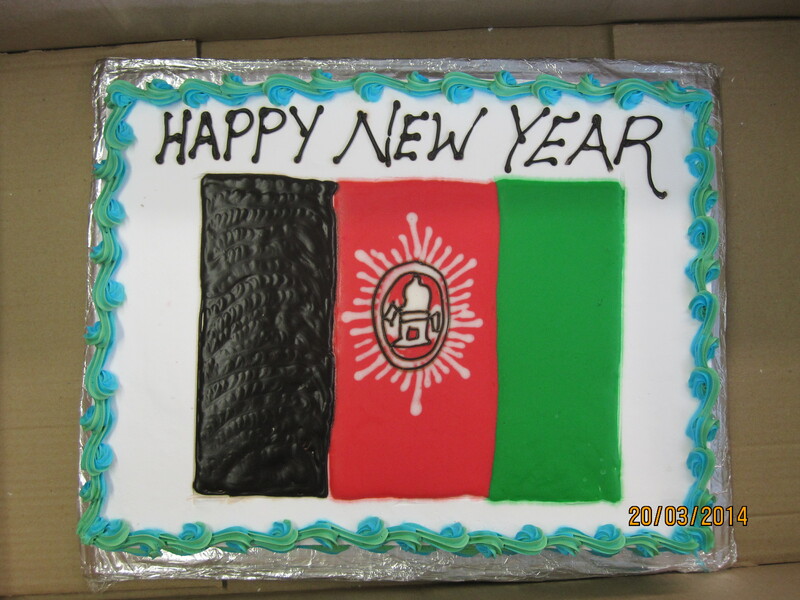 A cake decorated with the Afghan flag and the words ‘Happy New Year’. When the team arrived at the medical centre they were taken to the ANA Colonel’s office and as is customary the food was set out on a cloth on the floor. The team sat cross-legged on the floor (not always easy for Westerners!) and ate the food with their hands, which is traditional Afghan custom. I was told by the team that the food was delicious, which I was not surprised about as I shared meals with Afghan families several times during my last tour. The ANA hospital personnel were also very appreciative of the cake that the team had commissioned for them (pictured). It is always good to share these experiences with our Afghan colleagues as it shows an understanding and appreciation of their culture which is something we must always remember. Although casualties have been fewer of late I have still been called in on occasion when an ANSF casualty is en route to Bastion to arrange for transfer of the casualty to Shorabak where possible. Dependent on the extent of the casualty’s injuries the mentoring team will often go across to assist the ANA clinicians. Sometimes we get calls from the hospital in Shorabak asking us to review patients that they are concerned about, which involves bringing them over by an escorted ANA ambulance. One such casualty came in to the hospital a couple of days ago; he and several of his colleagues had been injured when an observation sangar collapsed. The ANA medics had noticed that this patient’s condition in particular seemed to be deteriorating and asked for the help from the Role 3 hospital at Bastion. On arrival he was assessed as having suffered a crush injury to his chest which had probably caused air and/or blood to escape in to the chest cavity, which was making breathing difficult. Further tests revealed the initial diagnosis to be correct so the team in ED prepared to insert a chest drain to rectify the problem. The ANA medic who had brought him over asked if he could watch the procedure as it would be a good learning experience for him – with the added bonus that he spoke some English and could act as an interpreter. I stayed too and translated from English to Pashto to the medic, who was then able to translate my Pashto into Dari for the patient (my Dari is pretty basic). It was a slightly unusual set up but it worked! It certainly tested my language capability as I had to explain every step of the procedure; not only so the patient knew what was happening but also so the medic understood what was happening. I think my brain was fried afterwards! Captain Lisa Irwin is a REME Reserve Officer currently on a three-year Full Time Reserve Service commitment with the Defence Cultural Specialist Unit. She has spent 15 months learning Pashto and Dhari before deploying to Camp Bastion to be the 2 IC of a team of medical personnel set up to mentor Afghan medical personnel. 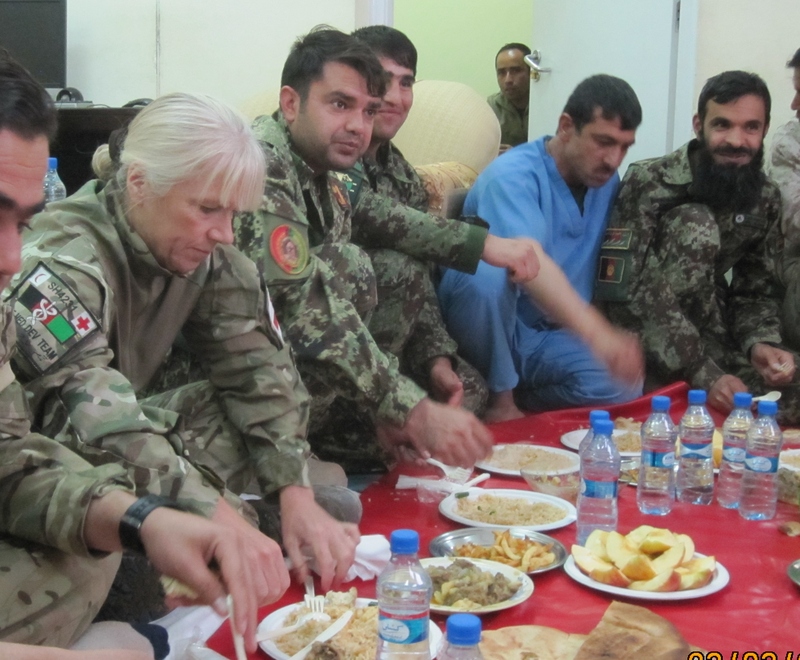 This is her third tour of Afghanistan and her second blog, as she blogged during her last tour in 2010/2011, when she was deployed as a Female Engagement Team Commander. The past week has been a challenging one for the ANSF Med Dev Team and a tiring one for me. We have been busy with routine visits to Shorabak when possible but also busy doing some reactive mentoring. 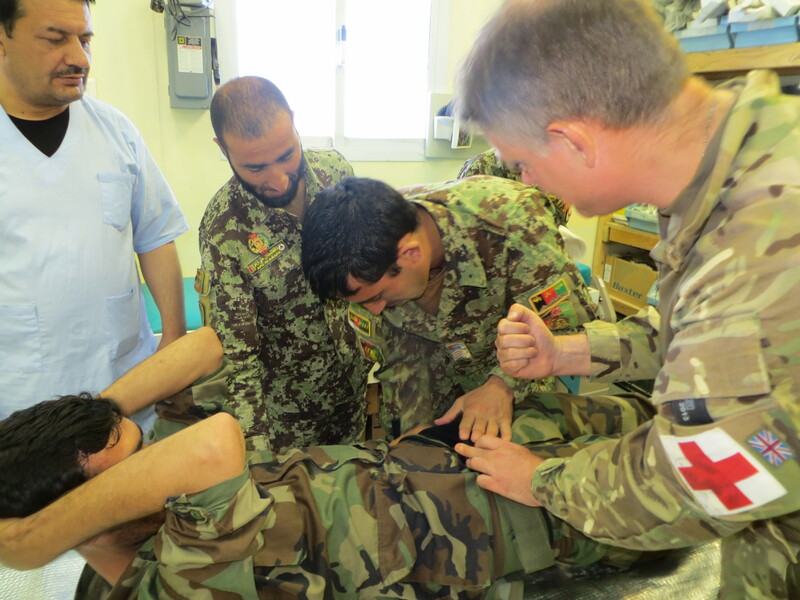 The Shorabak hospital has been relatively quiet so the guys in the team carried out teaching on things such as airway management rather than direct patient care and encouraged the Afghan medics to carry out necessary reorganisation of equipment. Whilst the guys were teaching my role was a little interpreting, chatting to everyone to maintain relationships and assisting in teaching. I had a book of Afghan poetry which was written in Pashto, and I showed it to some of the patients as I know that poetry is an important part of Afghan culture. They were surprised that I had such a book and even more surprised that I could to read it. I read some poems to patients who were unable to read (in the past many Afghans were unable to attend school) and they really appreciated it. It was such a simple thing but elicited a warm response from everyone in the hospital, patients and staff alike. 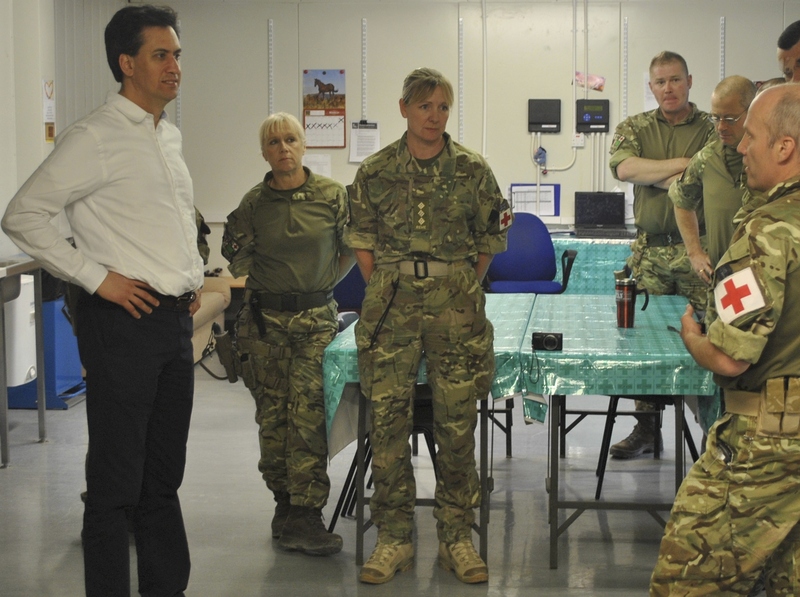 Ed Milliband (left) visited the hospital at Camp Bastion. We had a VIP visitor to our team in March. Ed Milliband was visiting Bastion and as he was coming to the hospital he visited our team due to our mission being considered important. He seemed a personable man and listened intently as my OC, Fletch, explained exactly what we do and introduced the rest of the team. He seemed interested in our role but I am sure that is a skill that all politicians quickly develop! As the week progressed the ANA were due to start a large military operation and therefore we started to prepare for a potential increase in casualties. As the casualties started to come in I was frequently called in to the hospital to be there as the casualties were brought in by helicopter. Once the casualties arrived I waited for the doctors to decide if the casualties could be treated at Shorabak, or remain in Bastion, for those who could be transferred I co-ordinated the transfer of the casualties to Shorabak. Some of them were suitable to be transferred without the team going over to mentor and others required mentoring. Our aim is to take over cases that are slightly complex and useful for us to mentor in order to increase the Afghan doctors’ knowledge and confidence, but not so complicated that they may be overwhelmed or not yet have the capabilities needed. The current set-up is a bit like a field hospital, and the new hospital being built will not be ready before July, so it would not be fair to the doctors or the patients to send over cases that are currently too complex. One of the first suitable casualties required abdominal surgery, and the operation was more complex than had been done at Shorabak before. However, the patient was assessed to be stable and suitable for transfer. We decided to take over only the team members that were needed, rather than the whole team, and gained permission to stay over slightly later than normal (our working hours in Shorabak can be restricted depending on the security situation). So the smaller team, with our Force Protection, headed over. When we arrived at the hospital the casualty was already in the operating theatre being prepared for surgery so the surgical team scrubbed up and went in to mentor the ANA doctors carrying out the operation. Meanwhile one of our nurses and I went in to the ward to see how many patients there were and make sure everything was up to date. I chatted to the medics and patients that were there, including two patients who remembered me talking to them in the Emergency Department in Bastion hospital – I suppose a blonde, white woman speaking to them in Pashto probably makes me quite easy to remember! As the operation progressed I was frequently checking on progress to see if we were going to be OK for time. I also reminded the Afghan medics that they needed to prepare a bed space for the patient to return to when he came out of theatre, with oxygen, monitoring equipment and other such things that a complicated post-op patient would need. Once the surgery was complete, the patient was taken to his post operative bed for overnight monitoring and care, and we were able to return to Bastion – the team satisfied with a job well done. The drive back to Bastion was slightly surreal as I had never driven through Camp Shorabak in the dark before but other than feeling slightly more vulnerable we didn’t encounter any problems. Talking to a patient on one of the ANA hospital wards at Camp Shorabak. The next day was almost a repeat of the previous day, with several more casualties coming through, some of whom remained in Bastion hospital and some of whom were transferred to Shorabak. Of the ones transferred to Shorabak another required abdominal surgery so again the team was stood up to go over and mentor the case. This time the as the surgery was ongoing there was another casualty with a gunshot wound to deal with, so three of us cleaned, irrigated and dressed his wound. We then moved him to the ward but no sooner had we done that than word came through on the radio that the Afghans were bringing in 3 seriously ill casualties evacuated by their own helicopter. Immediately I started chivvying the Afghan medics to make sure the Emergency Department was set up to receive them as the medics haven’t yet fully grasped the concept of preparation and tend to be more reactionary. At the same time I had to keep an eye on how the surgery was progressing as I was aware that we had a limited time in Shorabak. Eventually it became clear that the operation wasn’t progressing as planned and that we needed to take the casualty back to the hospital in Bastion, and at this stage there was no sign of the Afghan casualties. So after numerous phone calls and radio messages we loaded the casualty into an ambulance and we all returned to Bastion. Casevac’d for needing to pee! The next morning as I sat at breakfast reflecting on the past 2 long days my phone rang again as more ANSF casualties were en route. No relaxing breakfast for me then as I headed in to work. There had been an IED incident that resulted in a number of casualties and some were on their way to Bastion. On arrival the most seriously injured were immediately taken in to the Role 3 Hospital Emergency Department for assessment and treatment but one casualty appeared to have only minor injuries so he remained in the ambulance while he was assessed, as it appeared likely that he could be transferred straight to Shorabak. However, although the assessing doctor couldn’t find any obvious injuries the casualty was still grimacing in pain. Unfortunately due to the number of casualties all the interpreters were busy with other injured Afghans and so I climbed into the ambulance to speak to him to see if I could find out where he was in pain. Quite quickly I discovered the source of his extreme discomfort….he had an extremely full bladder and was desperate for the toilet! Once he had been able to pass urine he was absolutely fine (apart from a slightly sore back). Possibly the first time someone has been casevac’d for needing to pee! After yet another full and busy day I eventually crawled in to bed, exhausted. I suppose this is how my life is going to be for the next few months, with me taking advantage of any breaks I can get but acutely aware that I can be called in at any time. I wouldn’t have it any other way though as I enjoy the challenge and variety that the role can bring and I really enjoy being able to interact with the Afghan personnel and hopefully positively influence them. It may be small steps but I really do feel that my job, and more importantly the work of all of the ANSF Med Dev Team, is making a positive difference. We have had a testing few days as a team, after some Afghan patients presented at Shorabak with rare conditions including acute leukaemia, a brain tumour and some kind of systemic infection that caused hydrocephalus (fluid on the brain). Two patients died despite our best efforts, which was very sad, but there was some benefit as we were able to explain to the Afghan health workers in Shorabak how important it is to carry out regular patient observations and to act on any irregularities. We had a couple of good cases for reactive mentoring this week. One of the casualties had surgery following an IED strike but was otherwise stable so I helped to co-ordinate his transfer to Shorabak and set up the team to go over with him. Whilst surgery was being carried out in the Shorabak operating theatre I acted as an interpreter on the ward and in the laboratory, as we only had one local interpreter with us and he was needed in theatre. I was really pleased that I was able to interpret most things and I used my nursing experience to encourage the Afghan medics to ensure they had all they needed, and were ready, to receive the casualty on the ward once he came out of theatre. While I was there I helped another patient who had become quite distressed. He is an ANA soldier with a good record for finding IEDs who had been caught in a blast, suffering facial injuries. He was concerned about his sight and the fear of long-term damage was making him anxious for his future. I held his hand and tried to explain that the healing process would take time. He calmed down but it was an upsetting conversation. On a lighter note my relationship with the Afghan medics and the local interpreters goes from strength to strength. One of our interpreters recently came back from leave and told me he had brought some gifts back for the members of the team that were dear to him, and I was one of them! He then presented me with a lovely watch which was so thoughtful and a lovely surprise. One of the medics was trying out his best English to try and tell me how much he liked me, so at the end of our conversation (which had been in Pashto) he said to me ‘Goodbye, I love you’! It was very sweet but I’m not sure that was what he really meant to say! Still, whilst there are difficulties associated with my role, I am still really enjoying it and loving the challenges it brings. This week has passed very quickly. I have been across to Shorabak with the team every day except Friday (we don’t routinely go across on Fridays due to it being their religious day) and in the last week the Shorabak hospital has been quite calm. There has been a small, but steady, number of patients and the Afghans have been coping with them. Occasionally when we visit our doctors may advise their doctors on the most appropriate management of some of the cases but generally they have been able to cope on their own. However, there haven’t been many major trauma cases recently so our input hasn’t been required as much when it comes to patient management. It has been a useful week for the team though as we have been able to use the time to encourage the Afghan medics to ensure their departments are well stocked and organised and to carry out some teaching. I meanwhile, either assist with interpreting when teaching is going on, or go on to the ward and talk to the patients. Generally I am incredibly well received as the patients really appreciate a woman being able to speak to them in their own language and like to tell me about what happened to them (most patients suffer injuries due to IEDs or gun shots) and talk about their life and their family. They are always very curious as to how I learned to speak Pashto and constantly tell me what a difficult language it is. I agree with them on that! While it is generally quiet at the moment ISAF still stand the chance of suffering casualties, which has happened on occasion in the past month. Any death from the coalition hits everyone hard. On previous tours I have been to repatriation ceremonies and I have always found them to be deeply moving, whether the soldier concerned was known to me or not. It is a difficult aspect of the job. I have been particularly fortunate this week to have been asked to help with one of the Afghan children on the ward here. The boy, who is aged around 14 (many Afghans are unsure of their actual age as birth certificates generally do not exist), suffered major leg injuries in an IED explosion while playing with his brother. He is naturally grumpy given what he is going through, so I was approached to perhaps do some reading and writing with him to try to occupy him. I had helped with his nursing care before so he knew me and he and his uncle, who is his guardian, were pleased to see me. My initial session was about establishing his level of literacy. He was illiterate, which is not uncommon in rural parts of Afghanistan, so I just spent the first session teaching him to read and write the first 5 letters of the Pashto alphabet (which has 42 letters) and to read and write his name. He seemed interested and happy but I wasn’t entirely sure as he was also in some discomfort and so concentrating was difficult. However, the following day lots of the hospital staff kept congratulating me on the change in him and how good my intervention had been. After I had left he spent ages painstakingly writing and rewriting his name and showing the staff his achievement. I am so pleased that I was able, with something so simple, to put a smile back on to his face. I have since been back and taught him the whole alphabet, some basic maths and made him laminated alphabet and picture flash cards and he has been thrilled. He excitedly tells everyone ‘She is my teacher!’, though in Pashto so only I know what he is saying, and shows everyone his work. He is due to be discharged to an Afghan hospital soon but is keen to continue so I have made some more work books for him to take with him. It has been so gratifying to be able to help him in this way and I am glad I was given the opportunity. Work has been gathering pace as I completed hand over and was handed my issue mobile. Friday is the Muslim religious day so we don’t go over to Shorabak for routine training and utilise the time to do team admin and training. However, this Friday our plans went awry as an ANSF casualty was brought in that we felt was suitable for transfer to Shorabak- he had a gunshot wound to an arm and a resultant fracture. I then had to kick in to action and phone all the relevant cogs in the wheel to ensure transfer of the casualty from our ambulance, to an ANSF ambulance and then to Shorabak; at the same time I had to notify the team members that were required and ensure we were ready to go. By the time we got over to Shorabak the casualty was already in the operating theatre and the Afghan team were ready to go, so the guys from my team went in to mentor them through the surgery. The surgery turned out to be slightly more complex than first thought and took several hours but we managed to assist the ANSF surgeons in stabilising the casualty. Unfortunately he had suffered major damage to a blood vessel and so had to be returned to Bastion for more complex surgery, but the ANA surgical team did their part very well and it was felt that it was a useful mentoring opportunity. Whilst that operation was ongoing another casualty was brought in by their evacuation chain and went in for surgery immediately after the other came out. On that occasion the ANA surgical team were seen to be more than capable of coping so we left them to it and returned to Bastion. Whilst the ANA may not have the resources that we have I am most impressed with their ability to overcome such issues and work hard to save their fellow warriors. Due to my role in theatre, and the fact that I am female and a reservist, the combat camera team came to talk to me yesterday with a view to me being involved in some kind of documentary/media piece. I was more than happy to take part but had to have several photos taken and wasn’t particularly comfortable with that- I hope they got my best side! What is going on with the weather out here? The days were getting sunnier, the nights starting to get shorter and the temperature was getting warmer so I was looking forward to not so cold nights and warm sunny days. How wrong could I have been? Helmand has had its first snow in 12 years and it is absolutely freezing! I must admit Camp Bastion covered in snow is a sight I never thought I would see. I wish it would go now though as getting out of a lukewarm shower into a cold ablutions tent is not a pleasant experience! I went back to Shorabak for the first time in a few days today (security meant it wasn’t possible for a few days) and it was good to get back. The staff in the Treatment Centre all remembered me and many came up to me saying ‘Leila (my ‘Afghan’ name) you are back!’ and some were hugging me in greeting. I was very pleased by their reaction as it shows how accepting they have become of me. A hug in greeting from an Afghan is not at all unusual once they know you and count you as a friend or good acquaintance. However, they are often a little more reserved about giving a woman a hug which is understandable given their culture. I am really pleased that they are happy to see me and like to talk to me as developing relationships is a key aspect of my job and doing so will give me more ability to recognise if something is wrong. If they regard us as friends then they are more likely to want to protect my team and I from the risk of harm. Working with the ANSF in their camp does bring risks but good relationships with our Afghan counterparts is the best way to mitigate that risk I was also able to chat to several of the patients today, as many of them spoke Pashto, which at the moment is easier for me than Dari. After the small talk about family, weather, where they lived/were from etc we then spoke about their injuries (one had been shot, another injured by an IED) and their continued struggle to secure their country against the Taliban. I find their resilience amazing and in some way inspiring. Afghans are incredibly resilient people who – as they are quick to tell you – are used to decades of war and fighting, and they are pragmatic too and just get on with things. Those I spoke to emphasised that they are very proud of their country and want to do all they can to protect it for their friends and family. They do not agree with the Taliban’s methods and motives and want, as do all Afghans that I have spoken to, to be able to live in a secure country and support their family. They aren’t asking for much. I wasn’t detailed to go to Shorabak today but I had some reports to catch up on and some general admin to do so I managed to stay busy enough. I also had a telephone interview to do with Army media back in UK to talk about my experiences as a reservist and my role out in theatre at the moment. It is going to be published in a newspaper supplement as part of International Women’s Day (March 8th). The combat camera team are planning to come over to Shorabak in the next week to take some photographs of me at work to accompany the article. That leaves me with the dilemma of which head scarf to wear….only joking- though I do have a selection as I have some from my last tour and I bought a new one when I got here. It is still bitterly cold here- so much so that we have had a few personnel injured by slipping on ice. That is not an injury pattern that we normally associate with a deployment to Helmand. Perhaps in Kabul yes, as it frequently snows there in winter, but not down here (we are quite a long way South of Kabul). Most days are cloudy too so the sun isn’t managing to get through and lift the temperature. Having done two previous winter tours though, I do know that once the sun does start to come out it usually warms up pretty quickly and in a few weeks we will be starting to complain about the heat! I have never done a summer tour though so I am not sure how I will cope with the intense heat in July/August. Ah well, I will have no choice but to get on with it! The past few days have been frustrating for me and my team. Unfortunately the threat state was raised so mentoring was put on hold. That meant we had a couple of days free; although in reality few of us were stood idle as the nurses and doctors in the team offered themselves to the hospital as extra hands/advisors, and myself and my OC caught up on essential admin. I too offered my nursing skills to the ward as two children are being treated there at present. They were happy for my help, especially as I could speak to the children in their own language. Seeing the injuries that some children sustain out here is very difficult- those particular children had been seriously injured by an IED whilst out playing and I find the indiscriminate nature of IEDs really hard. There has been so much suffering caused to innocent people who just want to be able to live a secure life. I have also managed to organise some extra language training for me at the Education Centre here in Bastion with an Afghan tutor. It is an asset I need to make the most of as there will be no such facility in a few months time when the draw down properly kicks in. I have started my fitness campaign proper too, I am determined to regain a good level of fitness and in the back of my mind is that I will be wearing a wedding dress in October ( my fiancé and I have finally arranged the date!) and I want to look as good as I can! Today the restriction on us going over was lifted and so we were able to send three quarters of the team over. I remained behind as it was felt prudent not to send too many people until we had assessed the atmospherics over there. I ended up being quite busy as we had several ANSF casualties brought in to the hospital by helicopter this morning, not long after my team had left for Shorabak. Before they arrived the reports indicated that some were seriously injured and one not as badly (most due to an IED, one had been shot). I gave the Liaison officer who organises the transportation of the casualties from Bastion to Shorabak a call to give him a heads up and called my team who were over there working to let them know. I then remained in the Emergency Department as the casualties were all brought in and assessed, in order to determine if they were potential cases for transfer to Shorabak. Not being experienced in trauma care (thankfully it is pretty rare in paediatric nursing in UK and blast injuries are pretty rare in the UK full stop) I found it fascinating and also a real eye opener. There were lots of people involved in caring for each casualty and their knowledge and experience was evident as each team dealt with their allocated casualty. I have been told that the Role 3 Hospital in Camp Bastion is the best trauma centre in the world and watching the guys at work I could see why. As it turned out the hospital director assessed them as requiring the specialist care that the Role 3 hospital in Bastion can give them due to the severity of their injuries, so everyone in the ANSF Med Dev team was stood down. I had a lovely, and interesting, evening tonight as I have been invited several times to take tea (chai- green tea) with the hospital interpreters and I managed to make the time tonight. They were really pleased to see me and we sat down and talked about family, jobs, poetry (considered very important in Afghan culture) and life in general. Nearly all the conversation was in Pashto, with the occasional help for me when I couldn’t remember how to say something or understand what someone had said to me. I was really pleased that I was able to talk with them for over an hour on a number of subjects. All that work at the language school is finally paying off! They have invited me any time and I intend to join them as often as I can- but I shall try to get my family to send some Scottish food that I can take with me to thank them for their hospitality. The past week (well just over a week) has been pretty busy so I haven’t had much time to myself. The weather is warming up and that historically has tended to mean more operations on the ground being carried out. It certainly seems to be the case now as there have been numerous ANSF casualties coming in to Camp Bastion and direct to Camp Shorabak and as a result my services have been required several times to co-ordinate patient transfer. Sometimes I have been involved in sending casualties from Bastion to Shorabak and at other times casualties have come in to Bastion whilst I have been with the team working at Shorabak, and I have co-ordinated them being received in to Shorabak Emergency Department. Not all casualties that have been sent to Shorabak have required mentor input as some had injuries that the Afghan doctors are more than capable of dealing with on their own; whilst others required a little guidance from us initially and we were then able to let the Afghans deal with the situation themselves. For 4 days in the past week I was in charge of the mentor team as my OC had taken a small number of the team up to Kabul to recce the Kabul Military Hospital. We need to fully understand the capability of such a hospital so that we can understand the likely capability of the hospital currently under construction in Shorabak and therefore tailor our expectations and mentoring accordingly. I was quite happy to be left in charge (and so I should be really!) as I am really gaining an understanding of the role, how we operate, and the numerous personalities I need to liaise with and work with. Plus I now have a good understanding of the numerous bits of paperwork and reports that go with the role. I find that I am working quite long hours (as is common for many people out here), with little or no time off, but as it is interesting and often challenging work I don’t mind at all. If casualties come in late and I am called in to the hospital I find I am rarely tired as the adrenalin kicks in and I become focussed. A casualty coming into the Emergency Department certainly sharpens the mind. I am involved in the whole process; from the initial report of an incoming ANSF casualty, to the helicopter coming in, and then the casualty being transferred by ambulance to, and assessed in, the Emergency Department, right through to the decision about treatment and onward care. There have been times when we have faced particularly difficult challenges; in particular there have been cases where the Shorabak team have wanted to send casualties to us as they have felt the casualties required the level of care that Bastion can give. Unfortunately for a variety of reasons we have not been able to accept them. The Afghans have surprised us by then coming up with their own solution to the problem and saved the patient. We have been very impressed by that and they have seemed very proud of themselves- justifiably so. I continue to be surprised by the resourcefulness of the Afghans and they in turn continue to be surprised by my knowledge of their language and culture, so it is an interesting relationship. I am glad that I will be working as part of the mentoring team until the new hospital opens so that I am able to see our (and their) hard work come to fruition. So here I am again, just over two and a half years since my last deployment, on a flight to Afghanistan for another tour. As I type this I am actually en route, flying as a passenger in a C17 aircraft, along with 15 other people and a Sea King helicopter! There is plenty of room to move around so we are actually quite comfortable (though not quite first class! ), but there are no windows for us to see out of so nothing to look at. It will be quite a long journey as we have two stops and at one of them we have a stopover of several hours to allow the aircrew to rest, so mainly I plan to sleep! So who am I and what am I doing? 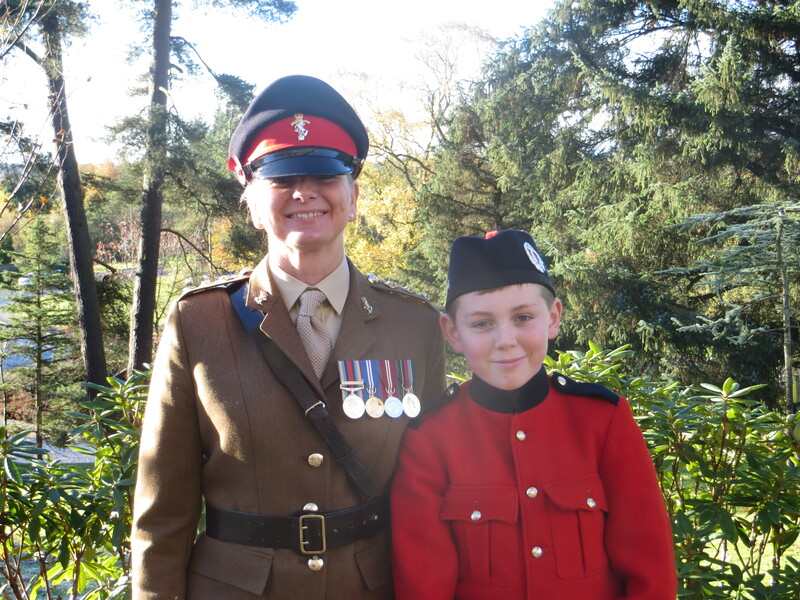 I am Captain Lisa Irwin, a 45 year old mum of three who is a Reserve Army Captain in the Royal Electrical and Mechanical Engineers (REME). I have deployed twice before; the first time as a SSgt Artificer (Vehicle Mechanic running a workshop) and the second time, after commissioning, as a Female Engagement Team Commander (out on the ground in the Nad-e-Ali area of Helmand patrolling with the ground troops in order to engage with local women). I am currently on a three-year Full Time Reserve Service contract (effectively a Regular Officer but on a short term contract) and during my contract I have spent 15 months studying Pashto, the language mainly spoken in Helmand, in order to deploy as a Cultural Specialist with the Defence Cultural Specialist Unit (DCSU). Originally I was meant to deploy on the ground, so that I could engage with locals and assist ground troops with understanding the dynamics of local people in their area of operation. However, as our mission in Afghanistan is drawing to a close we are no longer carrying out ground operations so that role no longer exists. Fortunately for me a different, and probably more interesting and exciting, opportunity arose and I am now deploying as the second in command of a team of medical personnel working with the Afghan Security Forces (ANSF) to assist them in setting up their own centre for treatment of their severely injured casualties in Helmand. I am probably well suited to the role as not only am I a linguist but I also have a medical background (I trained as a paediatric nurse after giving up engineering when my children were small). As a result I have had to also do a crash course in the Dari language (I did a 22-week course in three weeks!) as the ANSF mainly speak Dari rather than Pashto. The role should be interesting and working in close proximity with ANSF will bring its’ challenges, but I think my pre deployment training and previous operational and civilian experience means I am well prepared for the task. I am now settled in to my accommodation and have finished the initial training that is compulsory when you first arrive in to theatre. This training is a remind and revise on some things (such as first aid and shooting) and an update on the situation in theatre and how we need to act out here. Most things are similar to that which I was taught before so I feel on familiar ground- but I must remember where I am and not become complacent even though this is my third tour. I have met the guy I am replacing and some of the outgoing mentoring team, and I will start handover proper tomorrow. I have also met friends of mine already out here which is good, it is nice to meet up and grab a coffee together. Tomorrow will be my first opportunity to go over to the ANSF camp, Camp Shorabak, and meet the Afghans we are mentoring. I am very much looking forward to that. I am really hoping this job is interesting and rewarding as I am out here for almost 9 months. I will get R&R (a break when I get to go home for 14 days) but it is still a long time to be away from my children and my fiancé. I have been made aware that there may be other taskings for me that sound quite interesting, and will get me out of Camp Bastion, so I am hoping that they come off to add a bit more variety. Whilst Camp Bastion is a huge place, and at the moment we have excellent welfare facilities (I say at the moment as they will start to shrink as we pack up to leave), being here can still feel quite restrictive- we can’t just walk out of the front gate! The main up was finally going to Shorabak (the Afghan National Army (ANA) camp) to meet the Afghans my team are mentoring. The guy I’m taking over from introduced me and when they heard I could speak Pashto (and a little Dari) several came over to talk to me. They seemed thrilled that I could speak their language and many of them wanted to speak to me. I had also decided that I would wear a head scarf when working with them in deference to their culture and many of them commented on how nice it was and how much they liked it. All positive stuff. Another up was the outgoing hospital staff putting on a little entertainment this evening as they had formed a choir. The singing was great and there was some joke telling and also leek eating (raw leeks) as it was a Welsh unit. Great fun was had by all I think. The down was a phone call with my 13-year-old son with him sobbing his heart out for 10 minutes which resulted in a few tears from me too. I know he is happy at his boarding school (usually) and that the school is used to this as all the children have a parent in the forces, but I still feel so guilty and wish I could be with him to give him a hug. Sometimes the separation from your family is so hard. My daughter has also been quite ill since I left (paramedics had to be called) and will probably need an operation in the future so that is playing on my mind too. My problems are no worse than others though and I know if things were serious then the there is a system in place that would get me home. So I just need to get on with the job in hand. My handover continues and I am starting to get a handle on what the job entails and the numerous personalities I have to liaise with. It will take me a while to remember names but at least I know their faces and can hopefully put them in to the context of the appropriate job! Yesterday I went over to Shorabak again and was again very well received. The rest of my team were talking to their Afghan counterparts and finding their feet reference their task for the next three months (although I am here for eight-nine months most of the team are here for three, a few for six). At the moment it is all about developing relationships and an understanding so that we are able to effectively communicate with, and thereby mentor and advise, the Afghan healthcare team that we are mentoring. We will face challenges; one being the language barrier (although we have excellent interpreters), and my own language skills will hopefully prove useful, another will be trying to remember that we cannot expect the Afghan medics to work to the same standards that we are used to. They do not have the same facilities and nor do they have the same level of training, such as nursing degrees or even the same level of literacy, but our job is to try to bridge the gap where we can and help them to help themselves. As long as we remain flexible and believe in what we are doing I believe we can be successful and make a positive difference. A major challenge is difficulty acquiring sufficient blood products required for some operations, but we are working on a solution with the Afghans. They are setting up an emergency donor panel so that it will be possible to transfer 1 or 2 units to a patient immediately after donation, so we are looking forward to a case where a suitable patient presents and we can mentor them doing a transfusion. One aspect of our role is what we refer to as ‘reactive’ mentoring. At the moment we are still bringing some ANSF casualties in to Camp Bastion via our helicopter casualty evacuation chain. When such casualties arrive at Bastion we try to send them to Shorabak where possible so that their own medical chain can treat them. Should such a casualty present to the hospital in Bastion one of my roles is to be at the hospital to arrange for the casualty to be transferred to Shorabak for treatment, if it is felt that the Afghan medical staff will be able to successfully treat them. At the same time I would activate a number of my team and take them over to Shorabak to mentor the Afghans as they treated their casualty. Not all ANSF casualties arriving at the hospital in Bastion are suitable for transfer at the moment, although we are working with the Afghan medical team to increase their capability, so I may be called to the hospital as a casualty arrives and once their situation becomes clear I, and the team, may be stood down.